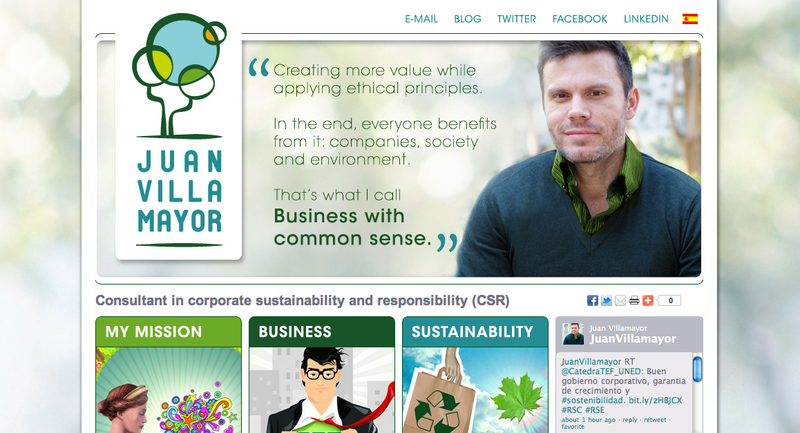 Today I finished the relaunch of the corporate look and the website for Juan Villamayor CSR. 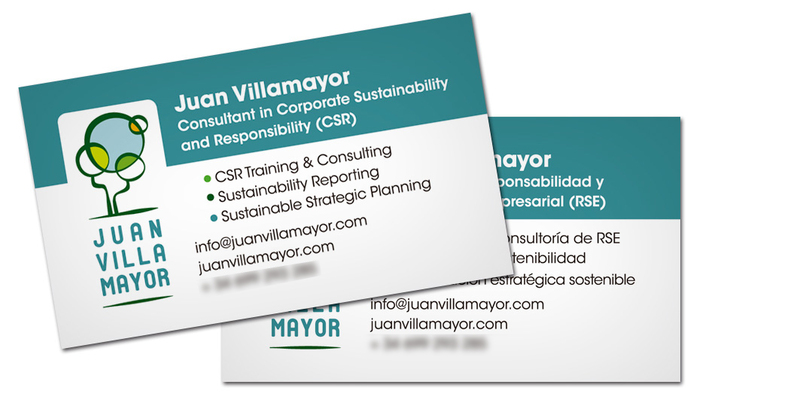 Juan Villamayor is a Barcelona based consultant for corporate sustainability and responsibility (CSR). He’s also a very active blogger about CSR matters and a member of the International team of the Green Den consultancy and co-works with Economistas Sin Fronteras. The old corporate design of Juan’s blog was a combination of illustrations (a tree, solar plaques, wind energy mills…) as a backdrop. The tree as a symbol of growth and life was the only item that was desired to be kept. However a new abstract way would be welcome. I focused on Juan’s message that companies, society and the environment all benefit from those business methods that create a shared value, while applying etical principles. I decided to reflect this by using overlapping bubbles, forming intersection areas in colours of dark and light green, turquoise and orange. Thereby, the former symbol of the tree got transformed into a more evocative shape, since you could also see it as two people having a dialogue. The font of the old logo version was kept but applied in turquoise blue. The main idea for the website was to create a very personal yet professional approach to new customers by displaying the person of Juan himself, his philosophy of work, the services he offers and the reasons why CSR is a real strategy tool for business. All this on one single page without overloading it with information. Social media tools should be clearly linked to this bilingual website. The new design was also adapted to his blog and twitter account.